While residents of India wait for Zomato Gold to launch in India in June 2017, the company has some other plans to keep the customers engaged. Deepinder Goyal, Founder and CEO – Zomato, has confirmed that the company is on track to launching Gold subscription in a couple of months. Complementing the Gold service, Zomato has announced the launch of Zomato Treats, a service that will offer you free dessert with your order at just Rs. 249 a year. This can be availed at any of the participating restaurants on Zomato’s platform. “With the aptly titled Zomato Treats, a subscription-based service for Zomato users in India as well as the UAE. If you live in any of the 16 cities where we offer online food delivery, a Zomato Treats subscription will get you a FREE dessert with every meal you order online on Zomato at participating restaurants,” says Mukund Kulashekaran, Business Head – Online food ordering at Zomato. Starting now, 20% of the users in Gurgaon will have the option to buy Zomato Treats and the company is rolling out to other residents in a phased manner. More people in Delhi-NCR and other 15 cities will be getting this service in the next two to three months. Zomato has also started another service as a pilot in Dwarka, New Delhi to provide a common infrastructure to restaurants as ways to improve their deliveries and customer service. Zomato has confirmed that Zomato Gold will be launching in India in June 2017. Initially the service will be offered in Delhi-NCR, Bengaluru, Mumbai and Hyderabad, but it will be expanded to other cities as well by the end of the year. The company has also clocked 2 million orders in a month in March 2017, which speaks volumes about the growth and commitment from its employees and founders. Zomato Gold will unlock a lot of deals for Indian residents who are looking for an exciting nightlife and don’t want to spend a lot of money. 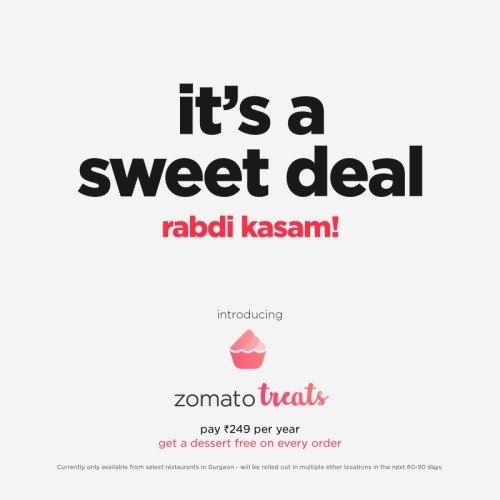 Now with your order you will get complimentary one portion of your favourite dessert from the same restaurant, which is not a bad deal considering you’re paying only Rs. 249 per year. The company has levied any limit on the price of the dessert, so pick your favourite one without hesitating. "Zomato Treats to Offer Free Desserts on Orders; Zomato Gold Launching in June 2017", 5 out of 5 based on 2 ratings. Totally worthless deal, zomato is one of the worst company and one of the worst CEO.